Two years ago I attended the Leadership Summit that Willow Creek Community Church puts on. I love learning more about leadership and God always has something profound to speak to my heart about at these events, usually on a more personal level than in how to lead better. But good leadership ultimately begins in the heart. Leadership in the Christian context ultimately begins with being able to follow a leader – Jesus. Courage means stepping forward in spite of our fears. If it were easy courage would not be necessary. At this conference we were given broken pieces of terracotta pots. As we sought God in prayer we were to write on the clay, His words to us. It hit me then that courage really isn’t mine. I do not have it in my flesh to persevere against difficult odds. It is only something I can do as I submit myself to God and obey and let HIM deal with the consequences of those actions. He knows better than I do what those ripple effects of obedience will be. I have to trust Him for the results. My only job is to obey what He leads me to do. A year and a half later I still look at that and remember. I’m challenged once again that I have to cast my fears at His feet and step into the scary work He sometimes calls me to. Ministry is hard and it has a cost and if we think differently we are probably not following God. It should scare us. It should stretch us beyond what we think we can do. God calls us to live beyond ourselves often so that we are forced to depend on Him. Last year I stepped into being even more serious about my writing. I stepped down from leading a ministry to write more because God called me to. The minute I decided to obey, God started opening up doors and affirming my choice. When my ministry responsibilities were done, instead of feeling a loss, I felt a huge weight off my shoulders and greater freedom to lean into His calling on my life – to write. To encourage. To redeem some of my pain through words. He pushes me further with every step and fear rears its ugly head and I’m reminded once again that it’s HIS courage – not mine. My job is to obey regardless of how I feel. 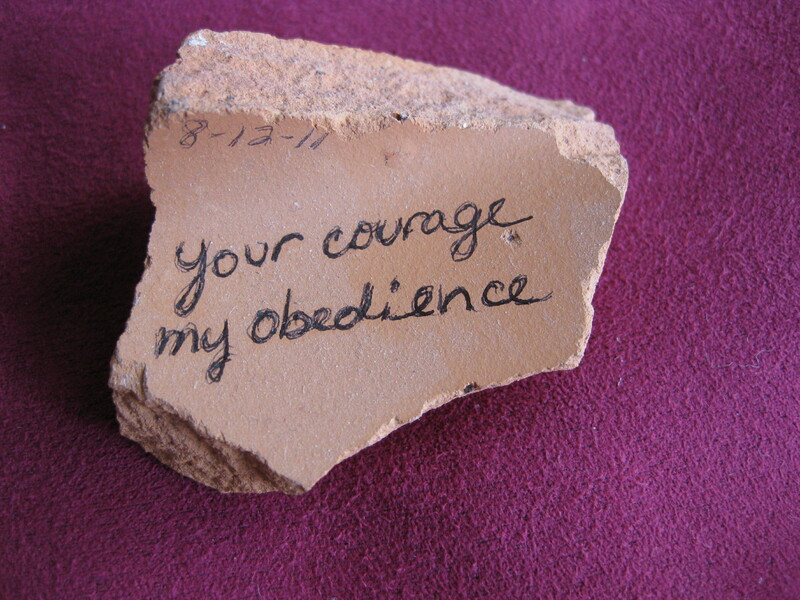 Having said that, in what ways are you being challenged to obey, and what’s holding you back?